One of the best things about learning the guitar is the fact that there are loads of 3 chord guitar songs beginners can start playing almost immediately. By almost, I'm referring to the fact that you will have to be able to form basic chord shapes, and change in between them, but once you can, you'll be rocking with AC/DC, and twisting and shouting with the Beatles! 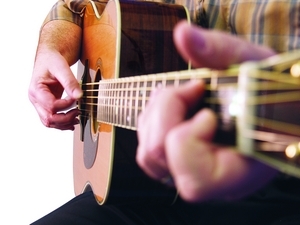 But first things first, learn those beginner guitar chords. They'll take you a long way, and are really the foundation to thousands, if not tens of thousands of really popular guitar songs. Also, being able to change in between these chords is very important, as once you start playing songs, you'll need to be able to move from one chord to the next, without much hesitation. So as you can see, you can start learning really cool songs on the guitar, just by knowing 3 beginner chords, such as the G major chord, C major chord and D major chord. Make sure to watch our beginner guitar lessons on songs, where I'll teach you to play the above, and many more songs in a detailed, step-by-step manner. All of the video tutorials include on-screen animated tabs and chord charts, which make the lessons really easy to follow, thereby reducing the learning curve.